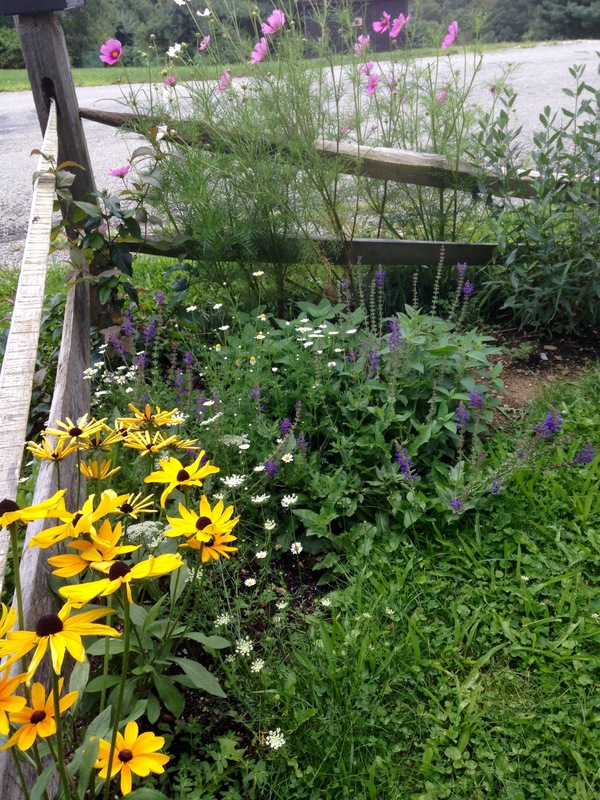 It’s filled with new perennials that decided to be first year bloomers –salvia, rudbeckia, daisies, and a bush honeysuckle. The cosmos self-seeded from last year and is blooming more profusely than ever. A caryopteris I planted last fall is just starting to get little blue fuzzy flowers; the monarda and the echinacea haven’t bloomed — they are just looking green and healthy. 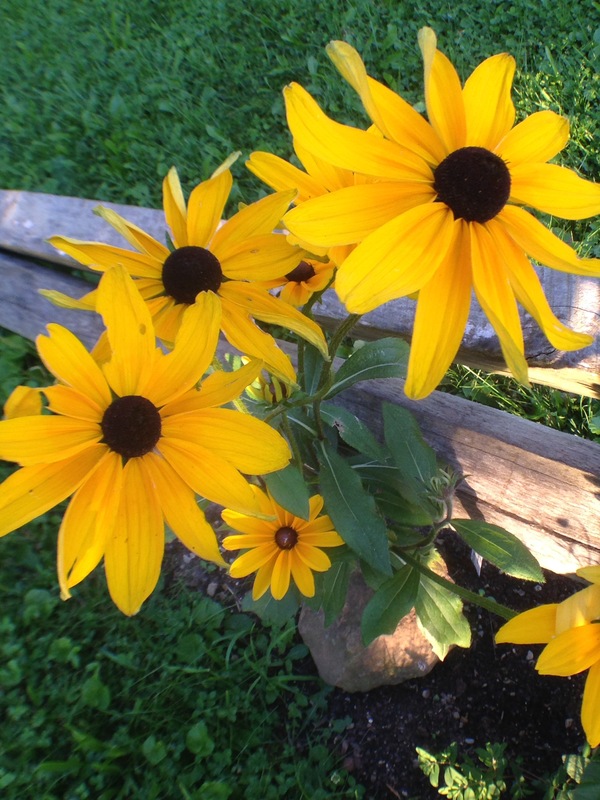 The daisies were just growing wild in the back yard. I transplanted them so red, yellow, pink, purple, and white flowers will bloom together in one little garden. These are the first flowers I’ve planted since we’ve been here at the cottage; the fruit trees and the berries and the grapes and the vegetables have taken precedence. I take so much pleasure from this small triangle of color out my window. Only easy-grow flowers that are on the Deer Don’t Like Me list are planted there; though a rabbit chewed on the coneflower leaves last night. 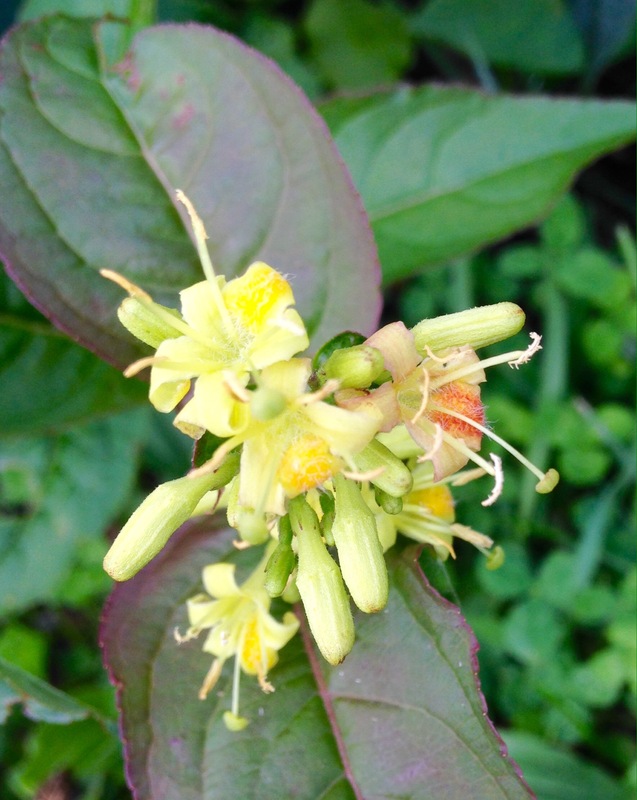 I’ve been keeping blood meal around the flowers to keep the critters out; perhaps that’s why they are so happy. Or it could be all the rain. The flowers love it; the vegetables do not. That’s why I am writing about the flowers instead of the sad unripe tomatoes; or the peppers with no blossoms and no fruit; or the squash with lots of blossoms but no fruit. Sigh. The flowers are splendid though, and they cheer my heart when I start to whine about the vegetable garden. 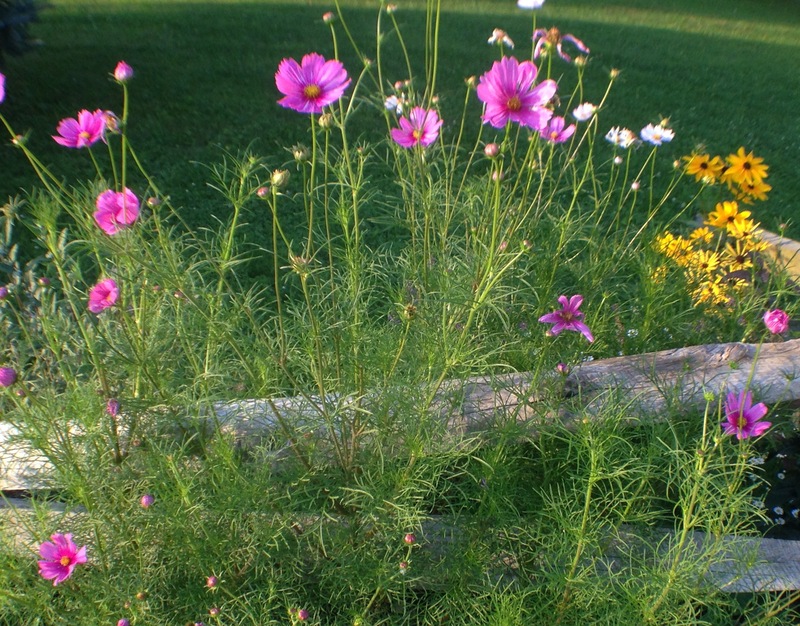 the beautiful Cosmos bipinnatus…you can never grow too many. Artemisia Silver Mound, Lamium, Sweet Woodruff, Rocket ligularia, Wild Ginger (Asarum canadense), Wood Fern, Oenothera, Lemon Balm, Poppies, Monarda, Peonies, Achillea, Echinacea, Hyssop (Agastache), Iris, Coreopsis, Balloon flower (Platycodon), Daffodils, Lambs Ears, Asparagus, most herbs. Snapdragons, Zinnias, Cleome, Lantana, Marigolds, Globe Amaranth, Ageratum, Dusty Miller, Larkspur, Nicotiana, Annual Vinca. Spirea, Blue Mist Shrub (Caryopteris clandonensis), Potentilla, Buddleia, Inkberry, Lilac, Korean Boxwood, Northern Bayberry (Myrica Pennsylvanica), Pieris Japonica, Mountain Pieris (Pieris Floribundas), Summersweet (Clethra Alnifolia), Leatherleaf Mahonia, Red Elderberry (Sambuca racemosa), Russian cypress, Daphne (Carol Mackie), Carolina Allspice (Calycanthus floridus), Hazelnut (Corylus Americana). This is just my list of what I like and might thrive here in Zone 6A. You might want to check out this site for a more compete list. But every list will add the disclaimer –Nothing is completely deer proof. Holly is on most every list of plants that deer won’t eat; yet the deer ate my two holly bushes down to almost nothing last winter — and we had a mild winter with almost no snow cover. Vegetables are delicious but flowers are for the soul. That definitely looks like a very happy garden. ☺️ Well done, Mrs.AHC! It’s the only happy garden here this summer. Even the onions are rotting in the wet dirt. Though I still have hope for the carrots and the big green tomatoes. Thanks. I have faith that your veggie garden will pull through. At the very least, if it is not a bump crop, you and Mr. AHC won’t starve. Your salvia encourage me. As kind of an OCD gardener, I was upset that my salvia were not staying in the little rows where I planted them, but were messily reproducing into clumps of salvia. The beauty of our plans going a different, unexpected direction is easier to see from looking at your garden. I hope you get some sun. It’s been wet here, too. Our veggies are doing about like yours. Our priorities in these early years have been orchard trees, vegetable garden and bees. Next year, flowers. Our pears (third year and second year) had ample blossoms–but wiped out by a late frost. It didn’t worry us–another year devoted to growth is a good thing. We should get fruit on almost everything, next year. No asparagus here, either, not to forgetting, but to vigorous debate! I so enjoyed this post. 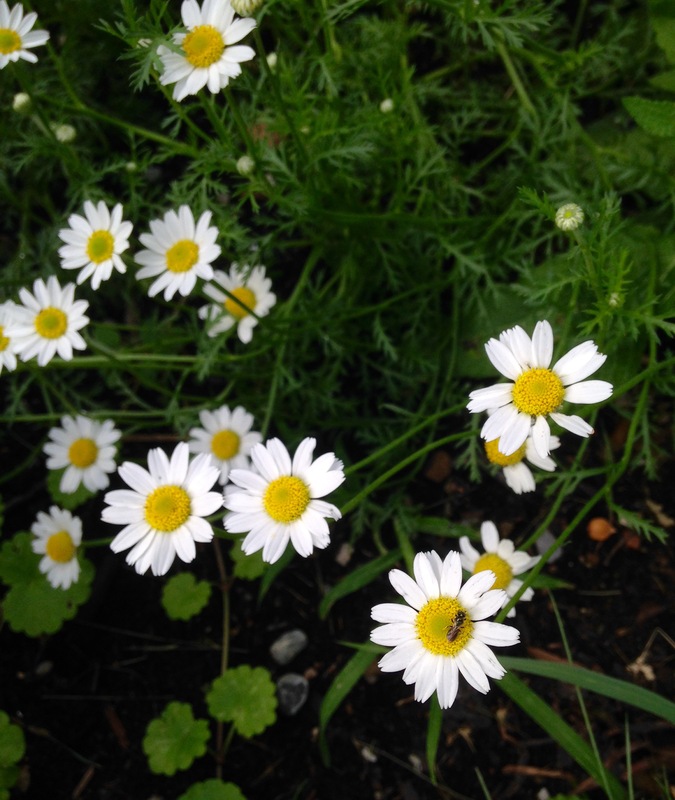 Your small garden is beautiful and your list of deer-resistant plants is useful. I copied it and will keep it for reference. I live in a small town in Northwest Colorado and we have a substantial resident population of deer. They regularly munch on the begonias I insist on planting in my shade garden though I know they are doomed. This year they made it to August, which was a surprise and a pleasure. Yes, begonias are deer candy. So are hydrangeas – one of my favorites. We have the vegetables and the fruit trees fenced, but honestly? One can’t fence in the flowers! Although the other day I saw a whole group of hostas with an orange deer fence around them. It sort of defeats the purpose, but I sympathized with them…. Beautiful. Thanks for sharing these photos and your thoughts.